Happy new year from everyone here at PreCentral! It's been roughly a year since PreCentral was launched, and Palm and webOS have really come a long way since their announcement at CES 2009 - Jon Rubinstein has become Palm's CEO, the App Catalog has finally come out of beta, a vibrant homebrew community has sprung up, another webOS based handset has been launched, and much more. As you're recovering from your night of fun in whatever form it might have come in (champagne to the tune The Final Countdown at midnight here), you'll be delighted to know that the Catalog has officially hit 1000 apps. 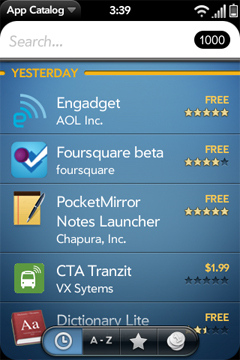 There are a few gems in the latest update that hit last night, most notably Foursquare in glorious beta form and a new native webOS application from one of our favorite tech blogs, Engadget. Here's to you, PreCentral members and readers. Here's to you, webOS developers and homebrewers. It would hardly be worth having a Pre without ya. Cheers!